With rail connections to the South West disrupted again this week, an alliance of councils and businesses has demanded billions of pounds of resilience measures and connectivity enhancements to the region’s rail network. The Peninsula Rail Task Force (PRTF) has published Closing the Gap, its 20-year plan for investment in the South West Peninsula’s strategic rail network and submitted it to the Government. The plan sets out the Task Force’s ‘ambition for a 21st century rail network’ underpinned by three priorities: resilience and reliability, faster journey times, and improved connectivity with sufficient capacity. It sets out priorities for spending up to 2019, including £284m on resilience measures and completion of committed flood relief schemes, and over £2bn of investment up to 2029. PRTF chair Cllr Andrew Leadbetter said:‘Our message to Government is clear: there must be real enhancements to our rail network, improving existing provision. Reduced services, loss of connections and slower trains are unacceptable. The Task Force recognises there is a huge funding and resource pressure on Network Rail, but our rail line is essential for our economic growth and connectivity for our communities. ‘At present our railway lets us down. We have a line that remains vulnerable to the effects of climate change and extreme weather. An average journey speed of 69mph compared with 90mph in other regions that is only likely to get worse with HS2. We have passenger growth of 128%, twice the national average over the last 21 years. It is now time to close these gaps. 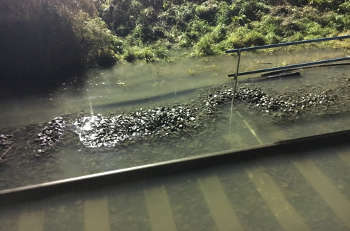 The vulnerability of rail connections into the South West peninsula was demonstrated again this week when the line between Taunton and Exeter was closed for over 24 hours after flooding at Cowley Bridge, Exeter, although diversions were possible via Yeovil. Network Rail said the damage ‘could have been far worse had recent resilience improvement work not been carried out to raise the signalling equipment in the area’ and that its Upgrade Plan would see further flood alleviation measures installed at Cowley Bridge by 2018. The PRTF report cites Cowley Bridge as an example of a committed scheme that should be completed as a priority.